I was recently asked what was the best piece of advice I could give to anyone thinking of writing a novel. Obviously, the answer was ‘get on and write it’- but I quickly followed that up with ‘join a writing group’. I took up writing when I moved abroad. Blogging about my experiences as we forged a new life in an alien land was cathartic and a lot cheaper than therapy. When I returned to the UK I joined a creative writing class with the aim of turning my blog into some sort of book – either a self-help guide for other ex-pats or a work of fiction – an idea still on the back burner. I’ve always been one of those people who’ve sort of meandered through life, as opposed to trail-blazing. I’ve never been particularly good at sport, and I’m definitely not musical, or particularly artistic. But when I first joined my creative writing class it was like – wow, I’ve found my forte. It really was a revelation; to fit in and find something I was actually quite good at. 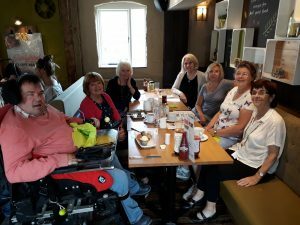 Six years on from that first class and another two house moves later, I still regularly meet up with a small group of my fellow students – not in a classroom situation but socially. Occasionally we convince ourselves we’re having some sort of creative workshop, but most of the time we just chat and eat. And it’s because writing is such an isolating occupation – yes you can sit in a cafe sipping coffee while you write, but you certainly don’t want to interact with the other customers – a support network of like-minded souls is vital. When I’m in full-on writing mode I want an empty house with no interruptions. But every now and then I have to come out of my cave. I still need people to bounce ideas off, to pick me up and push me on when I feel like giving up. People who understand the foibles of the creative process, who know how writing becomes a compulsion, a habit which has you leaping out of bed at midnight to scribble down a plot twist. People who know you don’t just put words into your book, you put your heart and soul. So I just want to give a little shout out to my group of like-minded souls, affectionately known as the Harem – one guy, several women. We don’t all write in the same genre, in fact Tania and Julia no longer write much at all, but Sally, Avril and Linda like their poetry, Anne and Ant write children’s books and Gill forges ahead into science fiction. The important point is that we’ve all been there for each other, through the trials and tribulations, the agonies of rejections to the joys of publication. 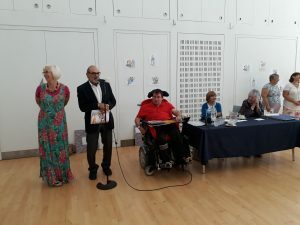 Anne Wan and Gill who writes as B Random have self-published, while Ant has a local publisher for his children’s stories about a magical wheelchair. This is Ant at the book launch of his second ‘Whizzy’ book. And if you think the gentleman reading an extract from Ant’s book bears more than a passing resemblance to a certain Belgium detective – you’re right! Some people have friends in very high places. Check out how Anthony writes his amazing books here. Writers really do support each other; there doesn’t seem to be a competition to do ‘better’ than anyone else – even though of course we all want our books to be bestsellers. It’s a bit like the Great British Bake-Off when the icing hasn’t set or the biscuits fall on the floor. Everyone rallies round and helps out. The fellow authors I have met through the Romantic Novelists Association and my publisher Crooked Cat have provided no end of useful advice and information. I feel I’ve made new friends, even though I’ve only ever met a handful of them in person. When I was an ex-pat I clung to other ex-pats because we had a common bond. I’ve discovered the same is true for writers. It doesn’t take one to know one – but it does take one to understand.